At 9:30 a.m. this day, as the American army raised the Stars & Stripes over Chapultepec Castle during the Mexican-American War, it simultaneously carried out a mass hanging of 30 Irish deserters who had gone over to Santa Anna — the Saint Patrick’s Battalion, or the San Patricios. Irish had been migrating to the United States en masse even well before the Great Famine got rolling in 1845. And for those of that great migration wave who wound up in the service fighting the Mexican-American War, there was a hint of deja vu — an Anglo and Protestant imperial power seizing land from a “black”* and Catholic neighbor? These were the plurality (though not necessarily the majority) of the couple hundred soldiers who comprised the Saint Patrick’s Battalion. German immigrants and other nationalities, along with American-born deserters (desertion during the Mexican-American War seems to have been rife), made up the balance. Knowing full well the fate that would await them upon capture, the San Patricios were renowned for their ferocity in battle; at the hopeless Battle of Churubusco, they reputedly forced down a white flag that Mexican comrades were trying to hoist on three separate occasions. Eventually, the ammunition ran out, and with it, the San Patricios’ luck. Within days, courts-martial began handing out death sentences to almost the whole of the surviving unit. 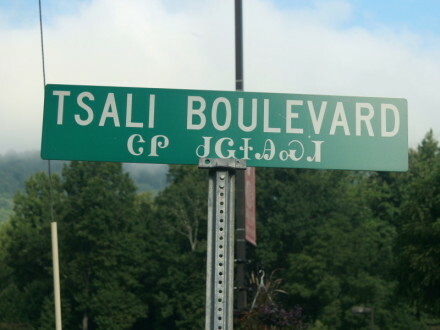 U.S. General Winfield Scott subsequently reduced a number of sentences, and those who had deserted before the war couldn’t legally be executed … but even the “lucky” ones suffered faint-inducing scourgings and branding on the cheeks with the letter “D”. And 50 men more were still bound for the gallows. Twenty hung in the days prior to this at two separate sites, but the Yanks’ piece de resistance was an orchestrated scene on the second day of the Battle of Chapultepec. On September 13, 1847, at dawn, Harney ordered the thirty remaining prisoners to be brought forward. They stood on wagons with nooses placed around their necks. This included one man who had lost both legs and was unable to walk to his own execution. The site of these executions was within viewing distance of the site where the final battle — the outcome of which could not have been in doubt — was to be fought. 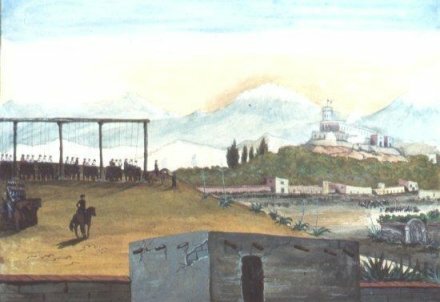 There the sentenced soldiers watched until finally, at 9:30, the US victors raised the American flag atop Chapultepec Castle.† At that point the order was given, the wagons were pulled away and the men were all hanged. these are the men that call us barbarians and tell us that they have come to civilize us … May they be damned by all Christians, as they are by God. The San Patricios are still honored as heroes in Mexico. They brand with hot irons the faces of the Irish deserters and then hang them from the gallows. The Saint Patrick Irish Battalion arrived with the invaders, but fought alongside the invaded. * The “blackness” of the Irish and the process of their “becoming white” later in the 19th and 20th centuries is one of the more illustrative and well-documented case studies of race and racism as social rather than biological constructs. The government itself, which is only the mode which the people have chosen to execute their will, is equally liable to be abused and perverted before the people can act through it. Witness the present Mexican war, the work of comparatively a few individuals using the standing government as their tool; for in the outset, the people would not have consented to this measure. Abraham Lincoln, then a young Whig delegate to the U.S. House of Representatives, excoriated President James K. Polk for lying the nation into war. † The capture of Chapultepec Castle, forgotten north of the Rio Grande, is still commemorated in Mexico for the heroism of six teenage cadets who died in its defense. The last of their number, Juan Escutia, leapt from the castle walls wrapped in the Mexican standard to prevent its capture.